Simple and functional program for calculation of current limiting resistors for circuits with LEDs. The software is simple and takes aim, you enter the data source voltage, voltage and current through the LED (clicking? 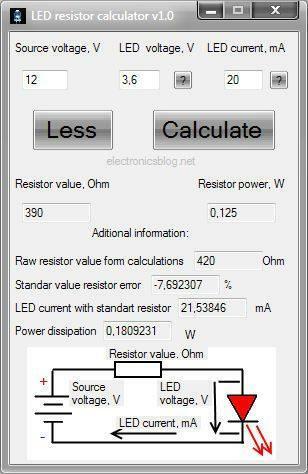 You can choose between the usual values​​), making it and clicking Calculate the software you will pass the information value resistor with a value closer to commercial as well as the calculated value, and as he approached the commercial value addition to informing the power required and power available to the commercial value of the resistor. Also get the value of the current pass through the LED.